Welcome to the COnfiguration and SElection of ALgorithms (COSEAL) group. 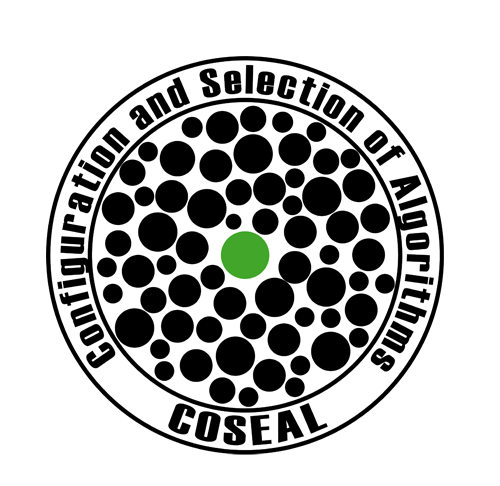 COSEAL is an international group of researchers with focus on algorithm selection and algorithm configuration. Both problems can be seen as instantiations of automated algorithm design, i.e., automatically optimizing the performance of algorithms. To cooperate, discuss new ideas and present the newest results, the COSEAL group has an active mailing list and an annual workshop. August 26-27 2019: The next COSEAL workshop will be in Potsdam (Germany). September 2017: We had a great workshop in Brussels with over 30 participants. Next year, we meet in Paris and in 2019 in Munich. June 2017: The Open Algorithm Selection Challenge (OASC) has started. September 2016: At the end of a sucessful workshop in Eindhoven, Leslie Pérez Caceres invited us to the next COSEAL workshop in Brussels in 2017. February 2016: The next COSEAL workshop (2016) will be in Eindhoven (Netherlands) at 12th and 13th of September. See you there! September 2015: We are happy to announce that the next COSEAL workshop will be in Eindhoven (Netherlands, 2016) — organized by Joaquin Vanschoren. Presumably, the next venues for the COSEAL workshop will be Brussels (Belgium, 2017), Paris (France, 2018) and Munich (Germany, 2019). September 2015: Thank you to everyone for a successful COSEAL workshop in Paderborn! April 2015: The organization team for the COSEAL Workshop in 2015 warmly invites you to Paderborn, Germany for the third annual COSEAL Workshop on September 14th and 15th of 2015.